confluence with Dorothy Creek, near the head of Knight Inlet. Proposed average generating capacity will be 280 MW with 800 MW during high flow conditions. The site is located on the mainland coast, 150 km north of Campbell River. A 10.3 metre tunnel, 17.25 km long, will conduct water from the diversion point to the powerhouse. The project includes a proposed 230 kV transmission line of 180 km, with aerial crossing of Johnstone Strait, to Campbell River. 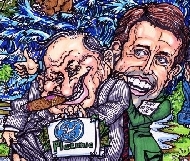 In October 2009, Pristine Power Corp. acquired a 57% controlling interest in the Klinaklini project from Kleana Power Corporation, a company of Dr. Alexander Eunall. 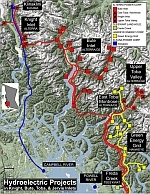 In May 2010, BC's Minister of Environment stated that the boundaries of Dzawadi/Upper Klinaklini River Conservancy would not be adjusted to accommodate the project, and in June, the project was dropped from BC Hydro's Clean Power Call. In August, Pristine Power wrote off its controlling interest in the project. Presumably, ownership reverts to Kleana and Dr. Eunall. By 2011, Pristine had become a wholly owned subsidiary of Veresen Inc.
More detail is in Kleana Power's revised project description, filed with the BC EAO in November 2007. Refer to Section 8. Also, see Hansard for the same date, beginning about  link. 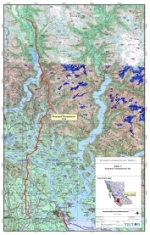 In this legislation, the BC government changed the boundaries of the Dzawadi/Upper Klinaklini River Conservancy to accommodate the First Nation, and the Klinaklini Hydroelectric Project. In this decision, Justice Fisher quashes Minister Penner's April 2010 decision.